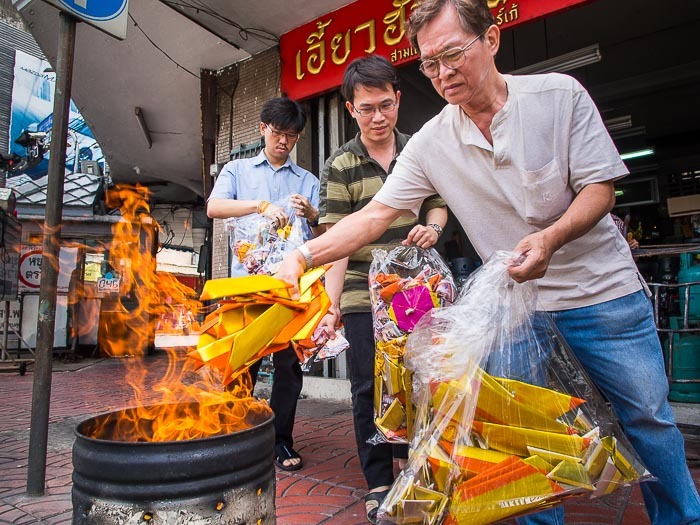 Men burn joss paper, that symbolizes gold bars, on Charoen Krung Street during the Hungry Ghost Festival. The seventh month of the Lunar Calendar is called Ghost Month. The gates of hell are thrown open and ghosts come back to wander the earth. It's a time of piety and celebration in Chinese Buddhist and Taoist communities around the world. Thailand is home to a large Chinese community and the first days of the month, the Hungry Ghost Festival, is an important holiday. 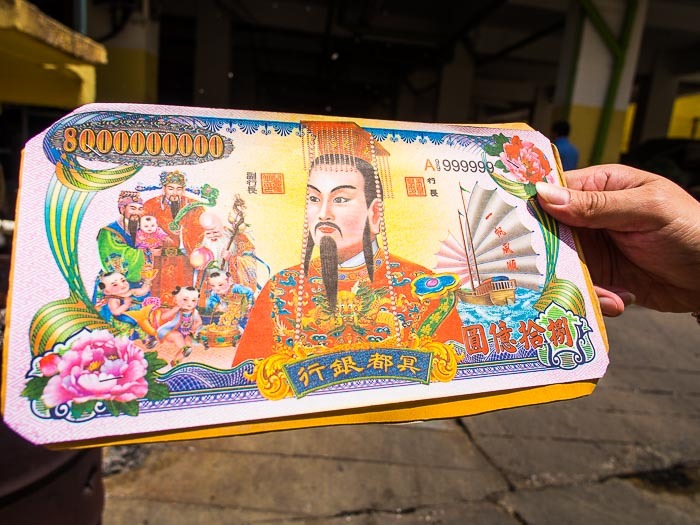 A man prepares to throw a stack of "hell money" into an incinerator. People burn joss paper, the paper represents the things ghosts need to ease their way through the afterlife. Suits, shirts, shoes, money, gold bullion are all incinerated. It's not a raucous holiday like Chinese New Year or the Vegetarian Festival, but it's widely celebrated and brings big crowds to the Chinese temples and shrines. 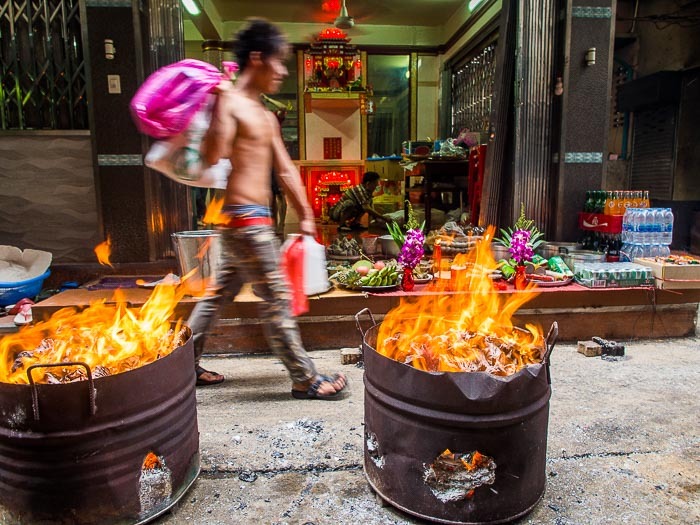 A man walks past barrels burning hell money and joss paper during the Hungry Ghost festival in Bangkok. 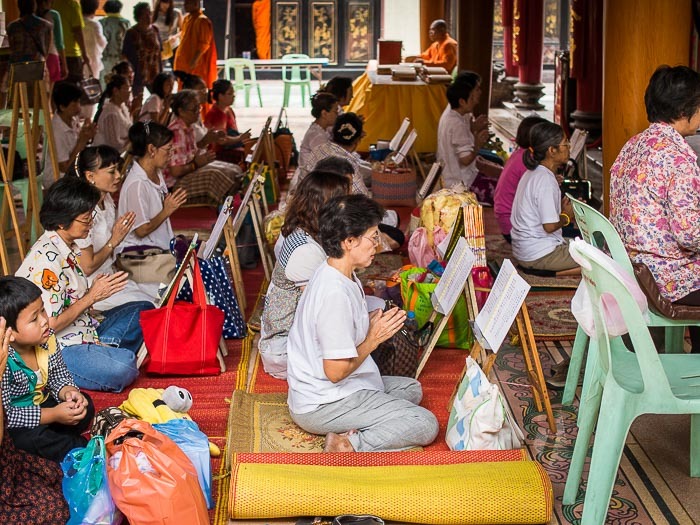 A service to venerate ancestors at Wat Mangkon Kamalawat, a large Mahayana Buddhist temple in Chinatown. There are more photos from Hungry Ghost in my archive or available from ZUMA Press.